OK, I admit it. I love pork. I like all kinds of pork. I decided it was time to do a dish that reflected my love of pork in all its forms. Welcome to Quatre Cochons de Montagne (Four Mountain Pigs). Of course, one of the best ways to cook pork is in the smoker, so the Louisiana Grills Pellet Smoker was the chosen tool. I started by cutting the cheese into 1/4 by 1/2 inch sticks. Then I put an elongated patty of sausage meat on the counter and pushed the cheese into it. I pulled the sausage around the sides of the cheese. 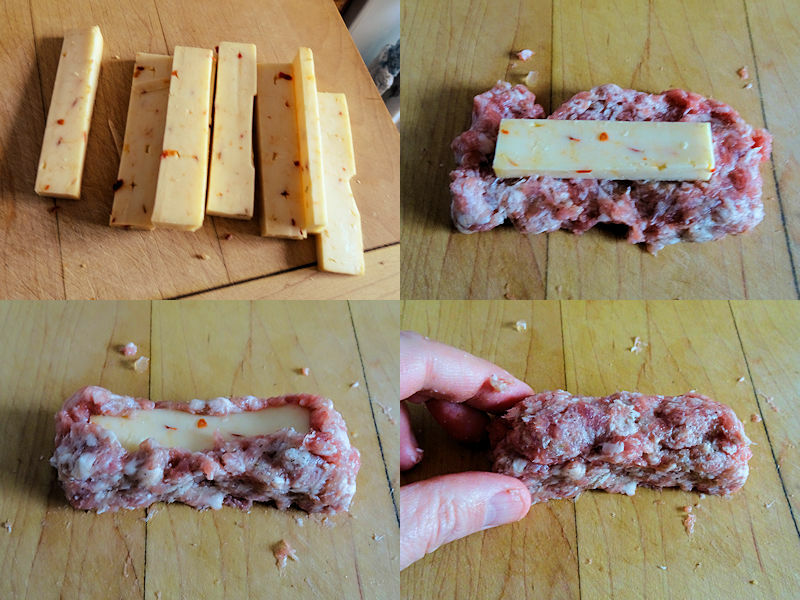 I took another small patty of sausage and pressed it over the cheese to seal it in sausage. Welcome to the first pig, breakfast sausage. 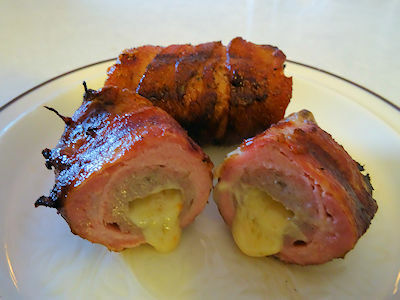 I thin sliced some ham and wrapped it around the sausage. Pig number two is ham. I cut the pork loin roast to about 3/8 inch thick slices. I put a slice between sheets of wax paper and pounded it thin (a little less than 1/4 inch). I wrapped the cochons in the pounded slices for the third pig, pork loin. I wrapped each cochon with a strip of bacon for the last but not the least of the pigs, bacon. Then I sprinkled them with Louisiana Grills Bourbon Molasses rub (you can use any sugar based barbecue rub). I smoked them in the pellet smoker that had been preheated to 350 F for 50 minutes. I turned them a couple of times during cooking. Be careful not to squeeze them while turning or you will force the cheese out. Once again, this could be done in a 350 F oven. It just won’t have that nice touch of smoke. She Who Must Be Obeyed was disgusted by this and described it as pigalooza. However, she did eat it all and had to admit it was tasty. The bacon and ham add a nice cure flavour to the spicy sausage. 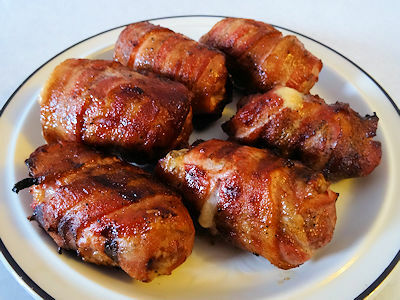 The cheese and pork give it a nice texture and the rub caramelized on the bacon. The next time you feel the urge for pork, don’t go half way, try this! Cut the cheese into sticks that are 1/4 by 1/2 inch. Put an elongated patty of sausage on a counter. Press a stick of cheese into it. Pull the sausage up around the edge of the cheese. Put another small patty of sausage on top to totally seal the cheese in sausage. Wrap the ham around the sausage. Cut the pork loin into slices that are about 3/8 inch thick. Put a slice of pork between two sheets of wax paper and pound to 1/2 of the thickness with a mallet or heavy pot. Repeat with all slices. Wrap the pork around the ham. Wrap a slice of bacon around each cochon. Smoke the cochons in a 350 F smoker or roast in a 350 F oven for 50 minutes, turning once or twice. Aw man, my invitation must have gotten lost in the mail! That looks amazing! Har! Let me know when your leaving and I’ll fire up the smoker! Now that is what I call using the whole pig!! Nice job David!! Thanks, Sam! I do love pork. This is a great post and I like how you give step by step instructions for the cooking challenged like me! So happy to have you on my blog roll! That is so kind. I had a look at your blog, very nice.